S.T.Dupont Diamond Drops Limited Edition Gatsby lighter sets new heights of luxury and elegance for a lighter. 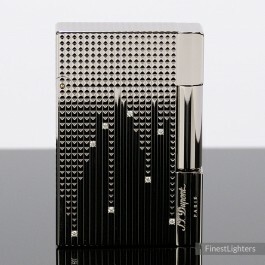 This lighter features a platinum finish and is decorated with a diamond head pattern which recalls a skyscrapers skyline. The lighter is set with 16 diamonds, 0.18 carats GVS2 quality. Only 1952 individually numbered pieces of this lighter were made in 2005, in reference to the year when the diamond head pattern was first created. For more information about "Diamond Drops" Limited Edition click here.